EXECUTIVE SUMMARY: Israeli and Russian interests in Syria are colliding. Russia’s new posture is challenging Israel’s defensive campaign against Iran, and Moscow and Jerusalem have so far been unable to defuse the crisis. 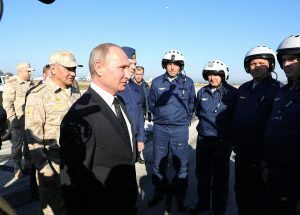 The crisis in Russian-Israeli relations that followed the downing of a Russian aircraft in September lacks an exit strategy, and has resulted in significantly higher tensions in the Syrian arena. Russia is seeking to pressure Israel into rolling back its air strikes in Syria, fearing that they will jeopardize the stability of the Assad regime. Moscow has waged a three-year air campaign in support of the brutal Alawite Assad regime in Damascus, and in support of the regime’s Iranian-led Shiite allies. The Russians were able to project their power into the heart of the Middle East, secure a naval port, an airbase, and a center of regional influence, while challenging America’s regional role. But the ongoing Israeli-Iranian conflict on Syrian soil could place those gains at risk by dragging the Syrian regime into the conflict. This means Russian and Israeli interests have begun to collide. PM Netanyahu has made it clear that Israel will not permit Iran to set up attack bases on Syrian soil, despite Russia’s new posture against Israel’s ‘War Between the Wars’ campaign in Syria. A series of signals over recent weeks indicate that Jerusalem and Moscow have been unable to defuse the crisis, after Russia placed responsibility for the deadly September 17 plane downing incident on Israel. Since the loss of the intelligence-gathering aircraft, Russia has rebuffed a succession of Israeli attempts to patch up relations, including the sending of a high-profile Israeli military delegation to Moscow on September 20, led by Air Force Chief Maj.-Gen. Amikam Norkin, to brief Russian air force officials on what occurred. Israel expressed sorrow for the deaths of the 15 Russian aircrew members, and explained that IAF jets had struck Iranian components for the manufacture of precision-guided missiles. The Iranian weapons were stored at a Syrian Armed Forces facility in Latakia, on the Syrian coastline, 25 km north of Russia’s Khmeimim Airbase, and were destined for Hezbollah in Lebanon. This appeared to have been an Iranian bid to use Russia as a cover to proliferate arms. The gamble by Iran’s Islamic Revolutionary Guards Corps (IRGC) was that Israel would not strike in this sensitive area. That assumption was proven false. Syria’s anti-aircraft systems then released a volley of inaccurate fire, hitting the Russian plane, when Israel’s jets were already approaching their bases for landing, according to Israel. Yet these explanations were rejected by Russia. On October 8, media reports emerged saying that Netanyahu had been forced to cancel a planned meeting with President Putin in Paris. Still, they managed to meet on the sidelines of a WWI memorial event in the latest attempt to deal with the crisis. Other media reports said in recent weeks that former Defense Minister Lieberman had been unable to reestablish a communications channel with his Russian counterpart, Sergey Shoigu, who had released belligerent statements in Israel’s direction in the aftermath of the plane incident. Lieberman and Shoigu had previously had a good channel for dialogue. Russia translated its new policy in Syria into action by transferring four S-300 surface-to-air batteries to the Assad regime. Syrian air defense crews are now believed to be undergoing training to learn how to use the systems, which can detect and track air traffic – including civilian traffic – deep inside Israel. Moscow has, in recent weeks, stepped up its criticism of Israeli air strikes against Iranian targets in Syria. FM Sergey Lavrov claimed on November 5 that the attacks will not improve Israel’s security situation, and criticized what he described as inadequate Israeli coordination efforts with Russian forces. These steps amount to a new Russian policy of applying high pressure on Jerusalem to scale back its air strikes. Nevertheless, international media outlets have carried reports of continued Israeli strikes on threatening Iranian activities in Syria, meaning Russia’s campaign has so far not achieved its goals. The outlook for the Syrian arena is therefore troubling. It is safe to assume that the Israel Air Force can overcome the S-300 systems, including through the use of the new Israeli stealth F-35 aircraft. These jets were specifically designed to penetrate and deal with advanced Russian-made air defenses. However, the apparent disconnect between the Israeli and Russian leaderships means an important part of the bilateral coordination mechanism for preventing mishaps in Syrian skies has been damaged. The deconfliction mechanism that was set up by Israel and Russia at the start of Russia’s air operations in 2015 had been effective until the rupture in relations. It extended from the highest government levels down to air force units. That cooperation is less effective today. It seems probable that the diplomatic crisis is having a negative effect on coordination between the two air forces. In the past, Russia’s air defense systems in Syria – the S-300 and S-400 systems – were there to guard Russian bases. Now, Moscow is actively delivering these systems to the Assad regime, with the express purpose of allowing Damascus to threaten Israeli aircraft. It could therefore be only a matter of time before the Syrians try to use the S-300 to fire on Israel jets. In that scenario, the Israel Air Force could be obligated to destroy the source of fire to protect itself. The fallout from such an incident remains unknown. In addition, the Assad regime, closely allied with Iran, could make the cardinal mistake of using the S-300 to threaten Israeli civilian air traffic. Although it is unlikely that Assad, who is busy consolidating his victory, would seek a new war with Israel, inadvertent chain reactions could still drag him into one. On the operational level, it is safe to assume that the Israel Air Force has learned how to remain undetected by foreign forces in the region, including Russia and its radar systems. This is essential for preserving the element of surprise. In addition, Israel will continue to enforce its red lines against Iran, meaning it will act when Iran brings advanced weapons systems into Syria or uses Syria as a smuggling route for arming Hezbollah. The only development that seems likely to defuse the Israeli-Russian crisis would be an Iranian retreat from Syria – but Iran has shown that it is committed to the goal of becoming a regional hegemon, despite growing pressure at home and from the Trump administration. The near future will be decisive in seeing how Israel, Russia, and Iran will act in this dangerous situation, and how the US will support its Israeli ally as Jerusalem navigates the evolving challenges in Syria.